Production homes are popping up everywhere as the Denver housing market continues to charge forward akin to many growing cities across the country. But with costs continuing to rise due to high demand, labor shortages, land availability and more; how can a builder provide a great product while keeping costs down? The answer is always: simplicity. 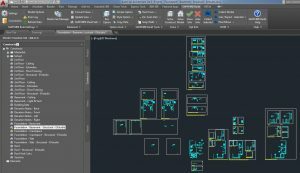 Build Option Manager has integrated its software into the AutoCAD software system, allowing the production home builder to use his best asset; repetition. 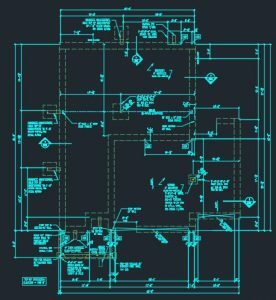 The drawback from the typical CAD software was in taking endless options and being able to compile them into a cohesive specific design ordered by a customer. Build Option Manager solved that issue and ushered in a game changer for customization within the production realm making it financially feasible for a production home buyer to get a custom home! How do they do that? Well, they built a complicated system with a simple concept. The software, by creating “box options” for each option provided by the builder; including options picked by the customers or necessary options for the builder such as different city codes, levels of finishes, site allowances, etc., then pulls the customer-specific choices into a final custom home. Let’s see an example. In the image above you can see parts of foundation pieces for a production home. In this case, there are garage options that can be chosen such as a two and a half car or three car garage. The options have their own “box” that the software recognizes as one part of the foundation whole it will stitch together. In the case above the three-car option was chosen. The customer makes all of the “custom” choices for his or her dream home, and the program delivers in record time. Though the initial setup is much more extensive than traditional drafting and SAPPHIRE Build Option Manager does require additional training for the CAD operator, the result is a net savings for the builders and a huge reward to the buyers. There are no limits to the number of options a builder may provide allowing the most flexibility possible for future buyers; the ultimate test for a production home builder.